Indian Coast Guard was formally inaugurated on 18 August 1978 as an independent armed force of the union with the enactment of the Coast Guard Act 1978 by the Parliament. However an interim Coast Guard Organization came into being on 01 February 1977. The motto of Indian Coast Guard is `VAYAM RAKSHAMAH -which means `WE PROTECT’. 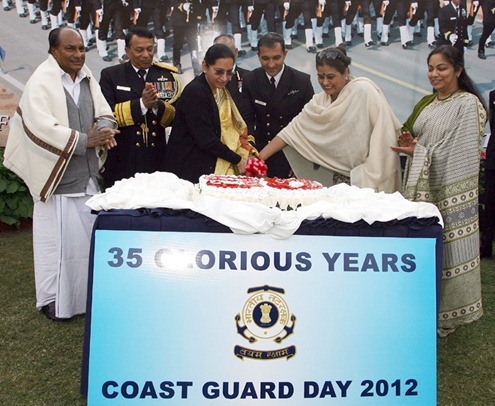 Indian Coast Guard celebrated 35th anniversary on 01 February 2012. The press release issued by Ministry of Defence on this occasion is reproduced below. The Indian Coast Guard is celebrating its 35th anniversary tomorrow. Since its inception, the service has grown into a multi-faceted and vibrant force, maintaining ‘round the clock’ vigil in the Maritime Zones of India, by deploying its multi-role ships and aircraft. Beginning with a modest inventory of two ex-naval frigates, the service today boasts of a force-level of 68 ships and 52 aircraft. During the past year, one ship, four interceptor boats, four Dornier aircraft and two Chetak helicopters have been commissioned into service, in addition to the establishment of six CG Stations and two Air Enclaves. The Indian Coast Guard today, is on a path of rapid expansion, as a large number of state-of-art ships, boats and aircraft are under-construction at various shipyards/PSUs. The service is expected to attain a force-level of 77 surface platforms and 56 aircraft by end 2012. The Coast Guard will also have 42 CG Stations, four Air Stations and 11 Air Enclaves functioning all along the coast, by the end of 2012. On the manpower front, the service has initiated several measures to augment its manpower viz. introduction of short service appointment for women officers and CPL holders, increase in number of recruitment centres, departmental promotions of outstanding Subordinate Officers and conduct of special recruitment drives. As far as CG operations are concerned, an average of 18 ships and five aircraft are tasked daily, to keep the vast Exclusive Economic Zone (EEZ) and coastline under constant surveillance. Further, the establishment of Coastal Surveillance Network (CSN) is being progressed to boost the surveillance capabilities along the coastline. 46 CSN Stations are being set-up under Phase-I of the project. Coastal Security has been on the fore-front of CG operations for the past few years. Today, Coast Guard stations and coastal marine police stations are functioning as ‘Hub and Spoke’ for information outflow. Standard Operating Procedures (SOPs) for coastal security of all the coastal States / Union Territories have been promulgated by the Indian Coast Guard. Synergy amongst various stake-holders is achieved by conduct of regular exercises and operations, and subsequent review of the SOPs. 17 such exercises and 19 operations have been conducted during the last one year. The service has also formed a bond with fishermen, by conducting regular community interaction programmes, so that they act as ‘eyes and ears’ for coastal security. About 400 such community interaction programs have been conducted since Jan 2011. Provisioning of biometric identity cards for fishermen and uniform registration of fishing boats for precise identification at sea, is under progress. Search and Rescue operations within the Indian Search and Rescue Region are undertaken by the Indian Coast Guard. Professional and dedicated efforts of the service have resulted in saving of 415 lives last year. A Search and Rescue exercise was also conducted off Mumbai on 14 Jan 12, in which international observers from seven countries participated. The Indian Coast Guard has carved a niche for itself at the international level and is today recognised as a leading Coast Guard in the region. Institutionalized visits as per Memorandum of Cooperation/Understanding with Japan Coast Guard and Korea Coast Guard are being conducted regularly. On 29 Jan 12, a combined Indo-Japan Coast Guard exercise was conducted off Chennai. The Indian Coast Guard, also hosted a Capacity Building Workshop with ReCAAP (Regional Cooperation Agreement on Combating Piracy and Armed Robbery against Ships in Asia) in Nov last year, at Goa. In addition, a bi-annual Joint exercise ‘Dosti’ is also conducted with the Maldives National Defence Force. The Indian Coast Guard has evolved into a mature and highly capable maritime force with state-of-the-art ships, boats and aircraft. 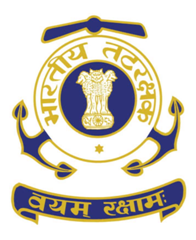 The theme of the Indian Coast Guard for the year 2012 is ‘Focused on Maritime Safety and Security’, which aptly reflects the commitment and resolve of the service, and is in tune with its motto ‘Vayam Rakshamah’ meaning ‘We Protect’. Here are some photographs on Coast Guard Day celebrations from Press Information Bureau. 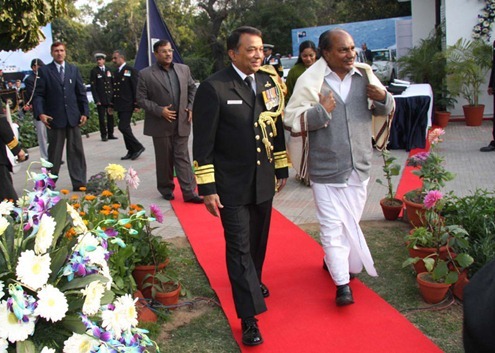 The Defence Minister, Shri A. K. Antony attended the Coast Guard Day celebrations at Coast Guard Headquarters in New Delhi on 01 February 2012. The Director General, Indian Coast Guard, Vice Admiral MP Muralidharan is also seen. Good to see Indian Coast Guard complete its 35 years. It is indeed one of the most reputed and highly established force of India and has been doing an excellent job in protecting Indian shores from the enemy. Salute to the Indian Coast Guard.